As the sun crawls over the far eastern hillside, a slight breeze pushes along the cotton ball-like clouds of mist hovering over the river surface. Preparation the evening prior has rewarded you the first cast of the morning, while those surrounding struggle to thread line through their favorite float. A foot prior to retrieval, your float slips silently beneath the surface; the snap of a rod later, you are rewarded with the cathartic bend of a rod. Fish on! The #10 Maxima makes short work of the catatonic winter buck. After a few pictures with your best friend, your line is back in the water for the second and final contender. When all is said and done, another picture perfect day has been stored in the memory bank — it wasn’t always this way though, was it? Though the reward of steelheading is far from extrinsic, having a few “silver bullets” lining the bank never detracts from the experience. To that end, ensuring that fins and scales are landed surrounds one critical aspect: preparation. If it can’t be done in 7 patterns, it is time to move water. After an evening of tying, the jigs are packed away for the morning to come. Seeing how conditions aren’t always to liking, 1/8th ounce jigs are prepared exclusively for heavier water conditions when 1/32nd ounce jigs won’t cut it. 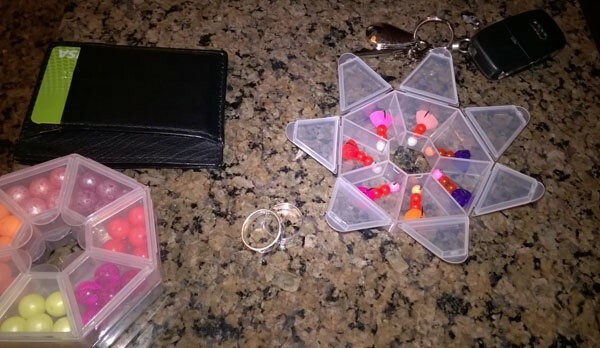 After securing the following items, everything is organized and placed in plain reach for the morning. Shortly thereafter, I’ll select where to fish and check the essentials: gage height and weather forecast. With those variables combined, I’ll do my best to predict the water clarity. If the water is on the rise, I’ll target the slots closest to the hatchery; fish will be on the move upriver, hesitant to stop until reaching their target destination. In lower water “on the drop,” (when the river level is steadily declining) I’ll target areas with heavier currents and places that provide cover, especially when water clarity exceeds 20 feet of visibility. 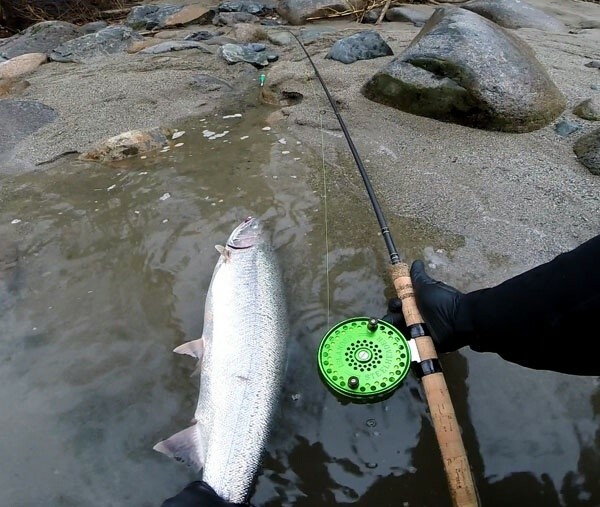 A steelhead successfully played to the bank on centerpin. For these conditions I’ll tie up primarily light pink and white color combinations, making certain to include one or two blue jigs in the batch. A top producer in clear water for winter fish has been all white, alongside white, blue and peach. 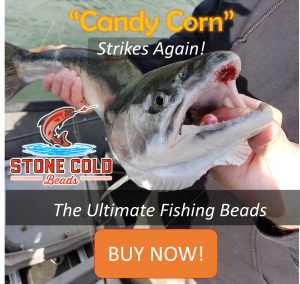 When fishing water tainted steelhead green, I’ll tie up standard steelhead patterns that consistently produce (steelhead orange, pink and purple and baby pink jigs with double-beaded bodies have consistently brought fish to the bank in these conditions). For silty or muddy water conditions when visibility is 1 foot or less, use dark colors. Contrary to popular belief, dark colors cast a larger shadow than bright colors in water with little to no light penetration; for those bright colors to “brighten up” to the fish, one must first have light, common sense being uncommon. Blacks, browns and purples will consistently out produce brighter colors such as chartreuse or cerise–during these common dry spells for average anglers–thus affirmed by my four hook-ups to none, working alongside my angling partner the evening prior. 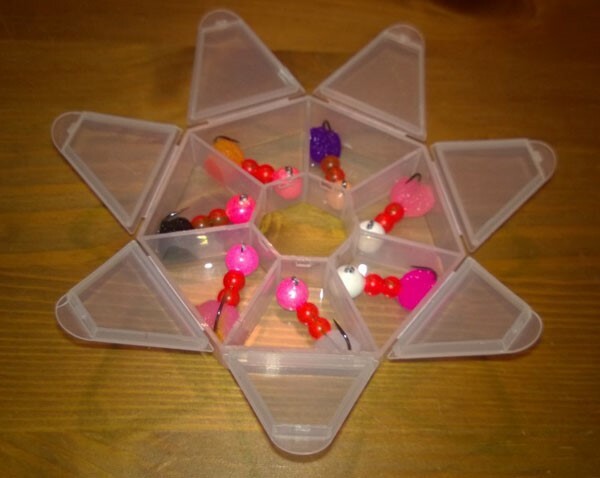 I recommend abstaining from talk of special flash-type super-materials when selecting or tying your own jigs — the fish don’t care as much as you do; you’ll wind up with excess material that takes up space and don’t consistently produce. For the one ardent in the school of thought that a fish will take a pattern with the addition of flash opposed to one without, while you may in fact be right sometimes, I believe you to be viewing the equation from a hindered point of view; it is undeniable that an angler will excel with the proper development of color cycling and approach to water. Don’t let your weaknesses in angling preclude your development of skill; strengthen and augment what you’re best at, prior to improving your weaknesses. After all, neither proficiency nor mastery is attained in one calendar year in steelheading, though the possibility to expedite the process exists, with perfect practice and the addition of good mentorship enforced. Let learning how to properly cater jig sizes, patterns and leader lengths to all water conditions is your ultimate goal — the fish will follow. The reward of preparation: a winter fish chugging along the inside seam on the other end of the line. When the action day comes, I arrive to the river bank no earlier than 9 o’clock as premature arrival during the winter season has never encouraged any memorable success; I find little satisfaction in battling lethargic fish with crusty eyelids, nor taking a limit home just in time for my favorite morning ritual of gridlock traffic. 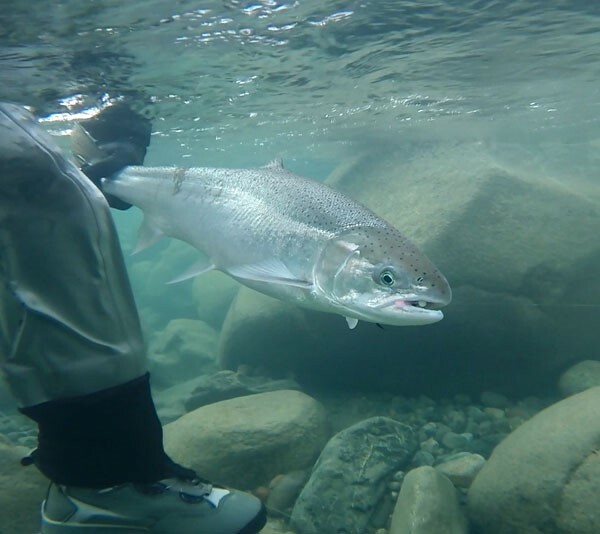 As a late morning angler, target slots are narrowed down to tail-outs and rapids, under the assumption the surviving morning fish are now hanging under the cover of heavier water, which happens to be an area cordoned off to experienced anglers. Though I no longer swing the spoon, I would recommend beginning the day with hardware, prior to slipping on the float. Regarding jig size, micro jigs have proven most effective when paired with a properly adjusted–and sometimes weighted–leader — even in heavier water. On #6 Maxima leader material, this winter buck hadn’t a chance once he inhaled this Reel Priorities micro-jig. If your drive is less than an hour, forget about the ice; in winter, the fish will remain chilled from the riverside. If your commute is over an hour, you will need ice. At all costs, keep the ice from direct contact with the flesh of your fish. Place the ice in a garbage bag wrapped in a thin sheet or towel prior to placement on the fish; this prevents negligible degradation of meat color and texture. Don’t take my word for it — ask your local fishmonger about the picture-perfect conditions for transporting fish. Fresh fillets from this bright Coho buck (harvested while chasing summer steelhead) provided excellent table fare after a proper filleting. At home, I let the fish sit in the refrigerator for a few hours, further solidifying the flesh to ease the process of filleting. Once removed, I’ll wipe the remainder of blood from the spine and remove the slime coating from the skin with paper towels. When it comes to filleting surfaces, cardboard is tough to beat with how firmly it secures the fish, in addition to cushioning the blade when quartering the fish. Upon completion, 4, gallon-sized Ziploc bags are packed–4 fillets to each– and stacked in the freezer; one night in the ice box will suffice prior to vacuum sealing. 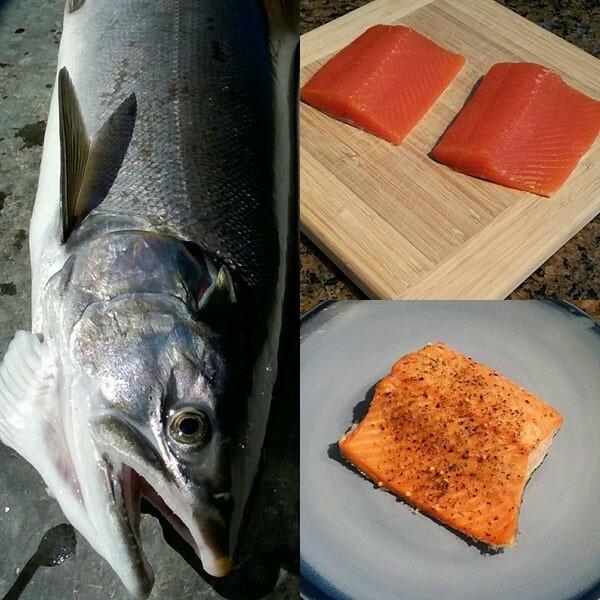 Correctly executing the following will not only provide you with the highest quality flesh–store bought fish greatly lacking on all fronts–but will save you the plight of continually producing soft, mushy fillets. When in doubt, point your finger at yourself; it will always reveal the remedy for the problem. And after all is said and done, it’s rinse and repeat until perfection. 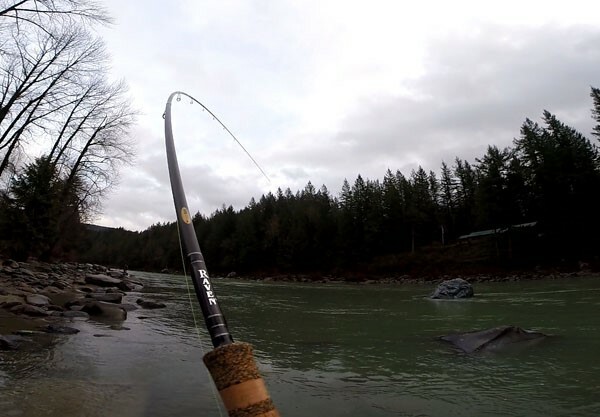 Welcome to the life of a successful steelhead bank angler. This second contender on cast 17, inhaled a blue-bodied, peach-tailed Reel Priorities pattern. Those peering into the life of a steelheader usually only see two things: playing fish and enjoying smoked fillets. Though both aspects are most enjoyable, they are not the reason why anglers return riverside season after season. I find the most rewarding aspects to be the perfection of self, process and outcome; it is up to you to decide which aspects of the sport captivate you. This particular process has been fine-tuned over the years; it produces consistent results, catered to a minimalistic approach — you will find no unnecessary variables here. For those of you still struggling to bring in a limit with each outing, I recommend first taking multiple outings to study your target water, in all weather and water conditions. 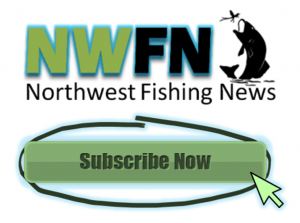 Once you learn how to correctly read water and identify the holding slots dependent upon time of the run and type of fish (summer or winter) perfect your strongest method of presentation (drift, float or hardware) paying close attention to learning how to cater color patterns to all water and weather conditions. Not all days end with bent graphite and silver sides, but they certainly can with the proper application of knowledge and practice. Remember: there is and will never be one perfect weight, pattern, style of presentation or bait cure that catches fish. 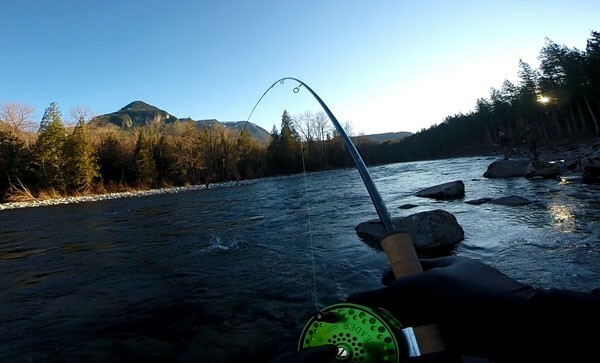 Though the recommendations aforementioned will take multiple years for the novice and a minimum of one year for the seasoned angler to achieve, remember to carefully weigh your heart before deciding if you’re fit for service as a steelhead bank angler — it is not for the uncommitted contender of light heart. May your reward be commensurate to that of your efforts on all fronts of steelheading. 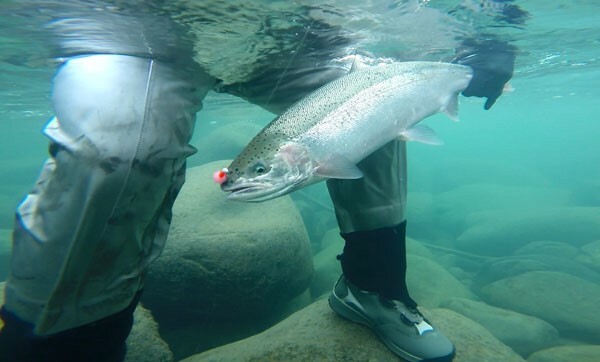 For those interested in learning how to get ahead in the game, keep your eyes peeled for next month’s article: Bank Anglers Only: Guide Approved Steelhead Tips & Tricks. Thank you for reading — Reel Priorities, out.